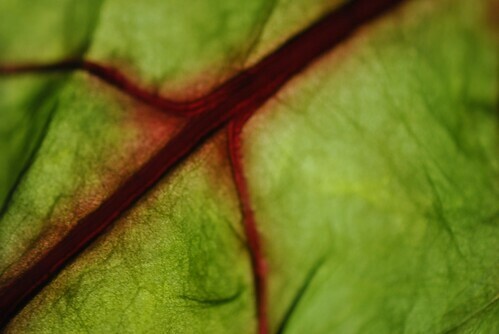 I want to like beets. I really do. But why do they make it so hard to like them? They are supposidly really good for you, and that color is just amazing! It was farmers market day, and I saw them, sitting there, looking so tempting. They were just whispering to me, saying “give us just one more chance…please!” I looked, and they were so small and the colors of the stems and leaves were so vibrant, I caved and bought a bunch. Once at home I started searching the internets for some way of preparing them where it was easy and did not require any special ingredients I didn’t already have in my fridge. I came across a recipe by Lidia’s Italy for a salad that used the entire beet (beet, stems and leaves), an apple and goat cheese. All which I had in the house. So, I gave them another chance. 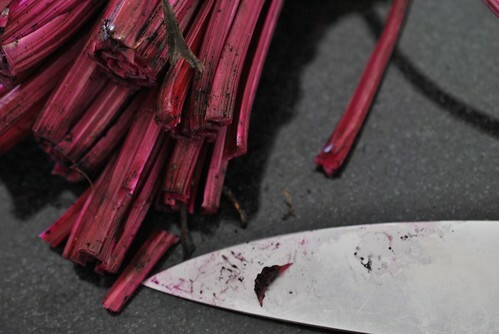 First I took a bunch of beets and cut off the beet from the stems. Then I cleaned the beets to remove all the dirt and trimmed the roots on the bottoms. I then put them in a pan lined with aluminum foil. I actually cut two of the beets in half because they were much bigger than the others. I tossed the beats with a drizzle of olive oil, covered the pan with aluminum foil and put them in a 350 degF oven for just under an hour. 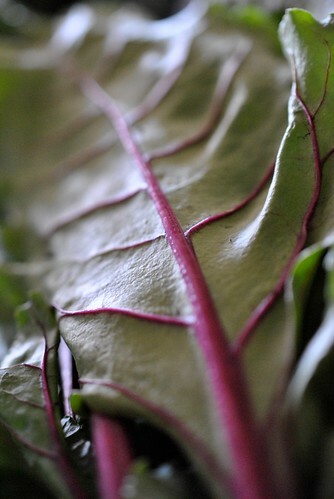 They were done when easily poked with a paring knife (do not use a chopstick…it is too dull and causes some hot beet juice to come squirting at you). Remove from oven and let cool. Meanwhile, I cleaned and picked through all the greens. Then I separated the stems from the leaves and put them in separate bowls. In a large pot of boiling water, I threw in the stems and let them boil for about 10 minutes. Then I threw in the leaves and let it all simmer for another 10 minutes, until the stems were soft. I drained the stems and leaves and let them cool. Once the beets were cool to the touch, I donned on some gloves (use some sort of gloves…they sell good cheap plastic ones at any asian supermarket) and rubbed the skins off the beets. Just apply some pressure, and the skins will rub right off. If you don’t wear gloves, be warned, you will stain your hands. 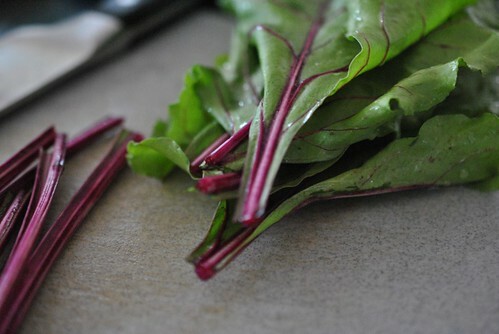 Once the stems and leaves were cool, cut them into 2 inch chunks and place in a large bowl. 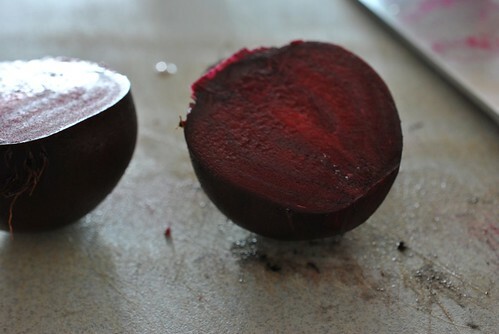 Cut beets into wedges (smaller pieces if you aren’t the biggest fan quite yet) and add to the bowl. Cut an apple into matchstick size and add into bowl. Take maybe a 0.25 cup of balsamic vinager and whisk 0.25 cup of Extra Virgin Olive Oil into it. Pour ontop of salad and toss. Crumble some goat cheese on top of the salad before serving. The result? It was surprisingly good. 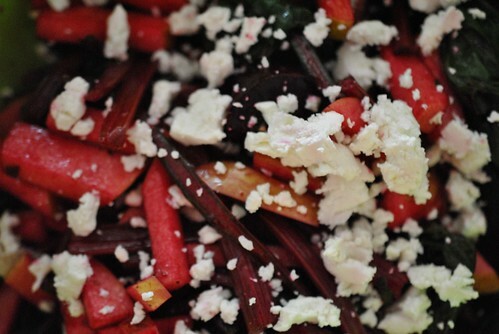 The apples and goat cheese helped cut the beetiness of the salad and complemented the beets very well. I really enjoyed it despite the fact that it was almost all beets. 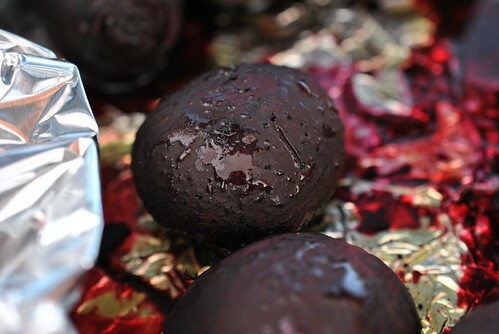 I liked the fact that the entire beet was used, so nothing went to waste. Would I make this again? Probably, but not in a heartbeat. I’m still warming up to these beets after all. This entry was posted in Dinner, Salad and tagged Apples, Balsamic Vinegar, Beets, goat cheese. Bookmark the permalink. 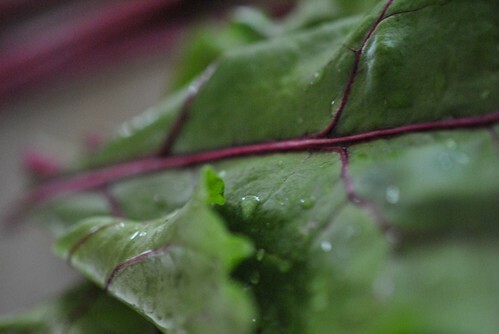 I’m a beet fan, but haven’t actually had the greens ever. This looks like a great way to incorporate them. You should try golden beets, if you’re still warming to them. They’re a little less earthy, but still gorgeous in color! I’d definitely consider golden beets if for nothing else than less stress when eating leftover beet salad at work. I was so afraid I was going to be walking around with stray beet stains somewhere on my face (because I still have not mastered the art of eating like a lady yet).